Backup is an operation to store the selected MS Outlook data into a specified backup file onto hard drive, writable CD/DVD, USB flash drive or other removable media. ABF Outlook Backup enables you to backup directly to hard drive, remote storage over LAN or any other medium without any other preparations. The only requirement is to have enough free space on the storage you are working with. You can also split the backup file up into several volumes to fit storages size (for example, when backup file does not go in one CD-R). See backup file volume options section for details. To start Outlook backup process, run ABF Outlook Backup, click Next on Welcome step - Backup or Restore step will occur. 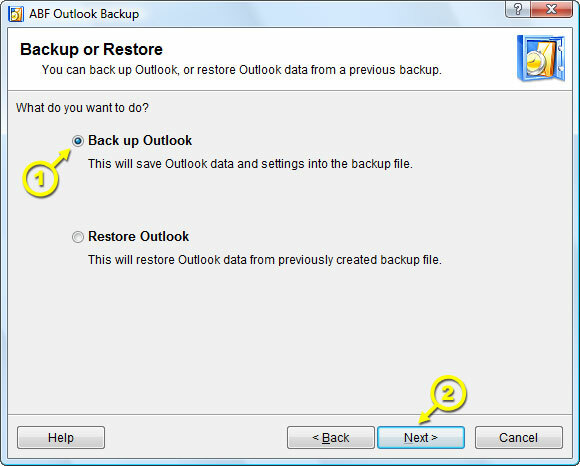 Select Back up Outlook (Figure 6; Pos 1) and click Next (Figure 6; Pos 2) to proceed to the next step.